Paul Gregson plays the organ while Linda dances with organ restorer Roger ! 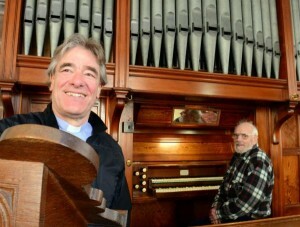 A man whose cat taught him to play the pipe organ has answered the prayers of parishioners at St Luke’s in Torver. After happening across the broken 1899 organ at a funeral last January, engineer Roger Mallinson has spent the last 9 months contorted behind the console fixing it. Vicar at St Luke’s Tim Harmer said they hadn’t been able to afford to restore the organ so Mr Mallinson’s help was “the answer to their prayers”. Here’s Mr Mallinson having a celebratory waltz with the church warden as Royalty Cinema organist Paul Gregson breaths life into the pipes. It’ll be officially launched at a concert this Sunday, Apr 26, with Claire Alsop, a friend of Mr Mallinson’s who usually plays the biggest church organ in Britain at St Mary’s in Bristol. This entry was posted in Special Events on April 30, 2015 by angelweb.